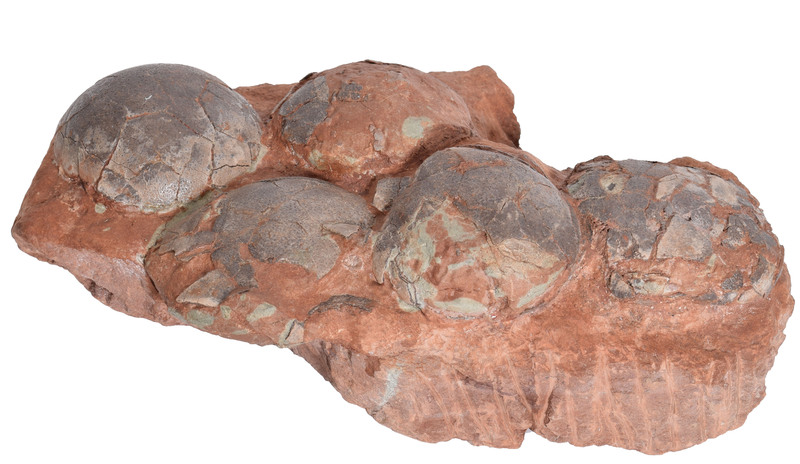 Five Therizinosaur Dinosaur Eggs. This original partial nest of five dinosaur eggs is from the rare and poorly understood class of dinosaurs known as Therizinosaurs, having some features of a plant eating dinosaur and some features of a theropod dinosaur. They had a small skull on a long neck with a large gut which resembled a plant eating dinosaur, but also were bipedal, had filamentous feathers, and extremely large hand claws like a theropod dinosaur. 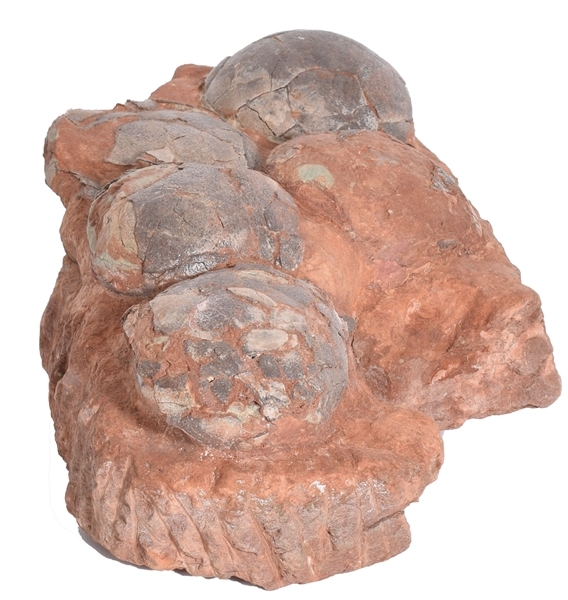 The five eggs are 3 1/4 x 3 1/4" long and are still contained in their original 11 x 7" red limestone matrix as deposited between 80-90 million years ago in the Xixia Basin of the Henan Province, China. The eggs are in excellent condition, being unhatched, inflated and air brushed to display the medium brown color. Even though the shells of Therizinosaur eggs are very thin, one egg has 100% of the shell, three eggs contain about 60 percent of their original shell and the last egg about 20% shell. Scarce.